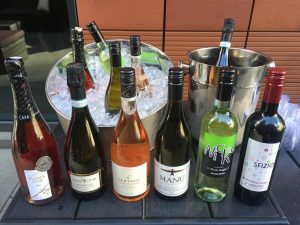 Last Tuesday, July 19th, we hosted a tasting at MAST’ restaurant, located at 45 Province Street, Boston, for Boston Event Guide’s Tasting Tuesday event – and we had a blast! Not only do we love interacting with our fans, but we love teaching them a thing or two about our wines, and why they stand out in taste and value in the crowded market. MAST’, located in Boston’s Downtown Crossing, offers a premier casual food and drink destination, featuring Southern Italian-European inspired cuisine, Neapolitan wood-fired pizza [don’t leave without ordering one!] and craft cocktails. Not to mention their patio is one of Boston’s hidden gems. We were so happy to be a part of The Boston Event Guide’s evening plans! This organization’s goal for Tasting Tuesdays is to introduce young professionals in their 20s, 30s, 40s… to new and upscale restaurants while networking and making new connections. Interested in attending one of these events in the future? Reach out to us and we will even give you the scoop before we blog about it! Let’s be WICKED good friends. This entry was posted in Boston, Events and tagged Borgo del Col Alto Prosecco, Events, Flama d'Or Cava Rose, Global Wines Inc, Le Versant Rose, Manu Sauvignon Blanc, MAST' restaurant, Recap, Sfizio Montepulciano, Summer fun, Wicked, Wicked Pinot Grigio, Wicked Wines, Wine. Bookmark the permalink. ← Get the Door… It’s the Liquor Store!